﻿ Gulf South Forest Products, Inc. » Blog Archive Gulf South Forest Products Receives President’s “E” Award for Exports at White House Ceremony | Gulf South Forest Products, Inc.
Gulf South Forest Products was recently awarded the Presidential “E” Award for Exports by U.S. Department of Commerce Secretary John Bryson at the White House in Washington, D.C. The “E” Awards are the highest recognition any U.S. entity may receive for making a significant contribution to the expansion of U.S. exports. With headquarters in Fort Lauderdale, FL and a 153,000 square foot storage/shipping facility in Mobile, AL, Gulf South Forest Products is a leading worldwide exporter of lumber, plywood and poles to 23 countries, shipping in excess of 103 million board feet globally. In addition to Mobile, AL, the company ships from several other major U.S. shipping ports. 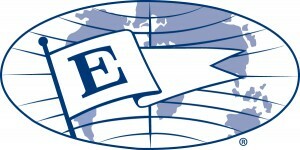 Official “E” Award for Exports insignia. A business client of the Department’s U.S. Commercial Service, Gulf South Forest Products has benefited from participation in many government and private sector export trade events to greatly expand its export sales. Approximately 95% of the company’s sales are export sales from the United States to foreign countries and regions around the world, including Haiti, Dominican Republic, Jamaica, China, Taiwan, North Africa, West Africa and other markets throughout the world. With an average annual export sales increase of 20% from 2008 to 2012, Gulf South Forest Products demonstrated a substantial increase in the volume of exports over a four-year period, a major criteria for the award. Gulf South Forest Products continues to expand its global sales by developing new markets for U.S. forest products, thereby helping to support the U.S. economy and create jobs in America. The company’s international shipping and export documentation expertise significantly reduces customers’ costs and helps minimize delays and potential damage and loss of goods. Following the catastrophic earthquake in Haiti in 2010, Gulf South Forest Products was a key exporter of lumber and plywood and among the first exporter to deliver these materials to Haiti following the tragedy. Charitable organizations such as the International Federation of Red Cross and Red Crescent Societies, MEDAIR, Habitat for Humanity and many others had urgent needs for treated wood products and plywood products. Gulf South Forest Products delivered these goods on Gulf South’s chartered vessels, provided technical data, and trained customers in Haiti about treated wood and lumber grading. U.S. companies are nominated for the “E” Awards through the U.S. Commercial Service office network in 108 U.S. cities and more than 75 countries which helps U.S. companies export. The primary criterion for the “E” Award is four years of successive export growth or of supporting the export growth of others. “E” Awards are awarded to applicants that can demonstrate a significant contribution to U.S. export expansion that is measurable, innovative, sustainable, and has broad impact. All nominations are reviewed by the “E” Award Committee, which is chaired by the Department of Commerce, and includes representatives of ExIm Bank, the Small Business Administration, and the Departments of Agriculture, Labor, State, and Transportation. 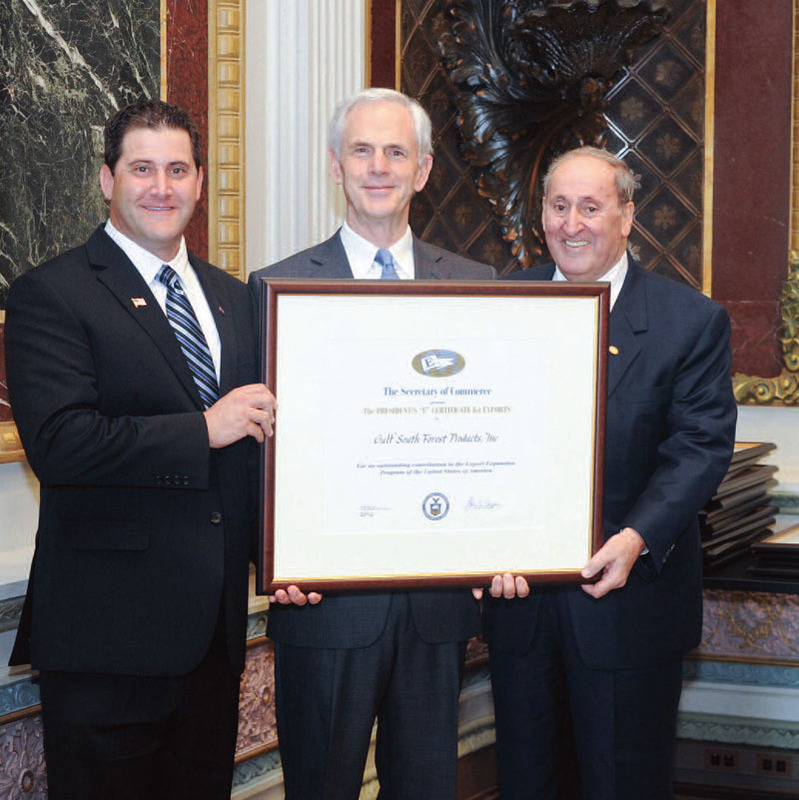 A total of 41 U.S. companies and organizations were presented with the “E” Award at a May 17, 2012 World Trade Week ceremony in the nation’s White House.